The 75th annual National Newspaper Week is October 4-10, 2015. This week-long celebration recognizes the important role that newspapers play in the lives of communities large and small around the world. 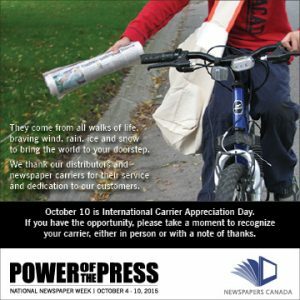 National Newspaper Week also includes Carrier Appreciation Day on Saturday, October 10. This special day honours the hard-working men and women who make a vital contribution to the industry. The 2015 theme is "Power of the Press." 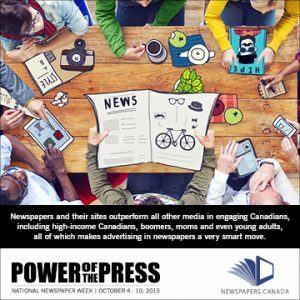 Newspapers Canada is pleased to provide a series of print and digital ads emphasizing the effectiveness of newspapers in delivering news and advertising. 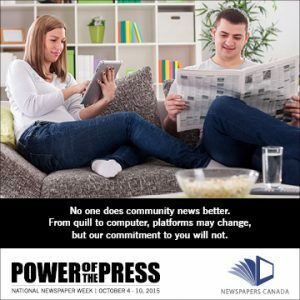 CNA and CCNA members are encouraged to download and publish these materials during this week-long celebration and promote the enduring strength of the newspaper industry. PC: Right-click on link. Then click on "Save Target As." MAC: Click and hold on link. Then click on "Save Link As." Additional materials, including editorial cartoons, puzzles, editorials and more, are available at www.nationalnewspaperweek.com. 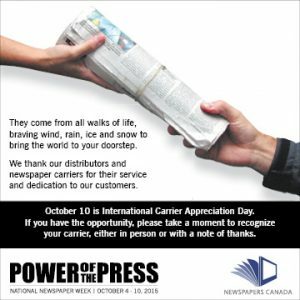 If you have any questions about National Newspaper Week or Carrier Appreciation Day, please contact Tina Ongkeko, Managing Director, Member Services, at tongkeko@newspaperscanada.ca. Print Half Page 7" x 10"